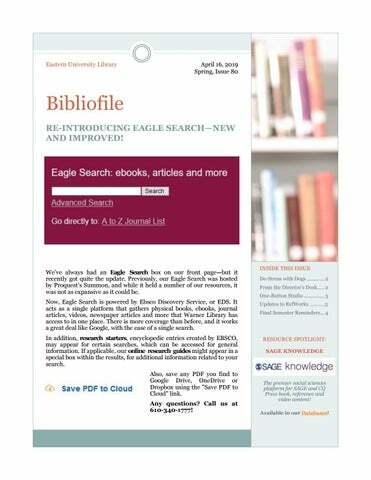 Bibliofile RE-INTRODUCING EAGLE SEARCH—NEW AND IMPROVED! We’ve always had an Eagle Search box on our front page—but it recently got quite the update. Previously, our Eagle Search was hosted by Proquest’s Summon, and while it held a number of our resources, it was not as expansive as it could be. Now, Eagle Search is powered by Ebsco Discovery Service, or EDS. It acts as a single platform that gathers physical books, ebooks, journal articles, videos, newspaper articles and more that Warner Library has access to in one place. There is more coverage than before, and it works a great deal like Google, with the ease of a single search. In addition, research starters, encyclopedic entries created by EBSCO, may appear for certain searches, which can be accessed for general information. If applicable, our online research guides might appear in a special box within the results, for additional information related to your search. Also, save any PDF you find to Google Drive, OneDrive or Dropbox using the "Save PDF to Cloud" link. Any questions? Call us at 610-340-1777! The premier social sciences platform for SAGE and CQ Press book, reference and video content! Available in our Databases! 7TH ANNUAL DE-STRESS WITH DOGS: THURSDAY, MAY 2, 10AM TO 3PM Calling all dog lovers! It’s time for our 7th annual De-Stress with Dogs here in Warner Library! After the huge success of previous years, we’re bringing back our four-legged friends for the Eastern campus to enjoy. When? Thursday, May 2 from 10am-3pm. These dogs are certified from Therapy Dogs International (TDI) (https:// tdi-dog.org) and Alliance of Therapy Dogs (ATD) (https:// www.therapydogs.com). This is Arnold, one of the new pooches coming to the event! This event is open to the entire Eastern community! So tak e some time to stop by, pet some lovable dogs and, most importantly, relieve some of that end-of-semester stress! Through the efforts of the library, and with financial support from a fantastic Eastern University alumnus and donor, the One Button Studio will be ready for students to use this Fall semester. What is a One Button Studio? New Citation Style Languages have b een added, including foreign languages. Publicly shared folders have en h anced spacing and indenting. References exported from databases or discovery tools—like our new Eagle Search!— through proxy are now properly imported. Users logged into RefWorks will not need to login during exporting. The One Button Studio is a simplified video recording setup that can be used without any previous video production experience. The design of the studio allows you to create high-quality and polished video projects without having to know anything about lights and cameras. You only need to bring your flash drive with you and push the Enter button on a wireless keyboard. The One Button Studio solution drastically simplifies the video production workflow, eliminating several time-consuming steps. The end result is a studio experience that requires the bare minimum of time and effort while simultaneously providing a consistently highquality result packaged on a thumb drive in a standard format video file. The studio will be located on the upper level of the library in Room 333. Questions? Please contact Joy Dlugosz, Project Developer (jdlugosz@eastern.edu) What kinds of things can you do in a One Button Studio? Reserves and Textbooks All materials currently on Reserve will be removed on Friday, May 10. Faculty, please arrange to have your personal copies picked up by the following Friday (May 17). Also, before the semester ends, you might want to consider getting rid of any extra books in your offices, including textbooks, and donating them to the library. We’ll add what we need, and give the rest away to African mission works or Better World Books. Annual Survey Another survey has been sent out to help us gauge our services available at the library. Make sure to check your email for our survey link (sent 4/12), and we encourage you to take 5 minutes to complete it. Thank you! Questions? 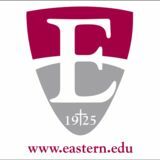 Email us at reference1777@eastern.edu.